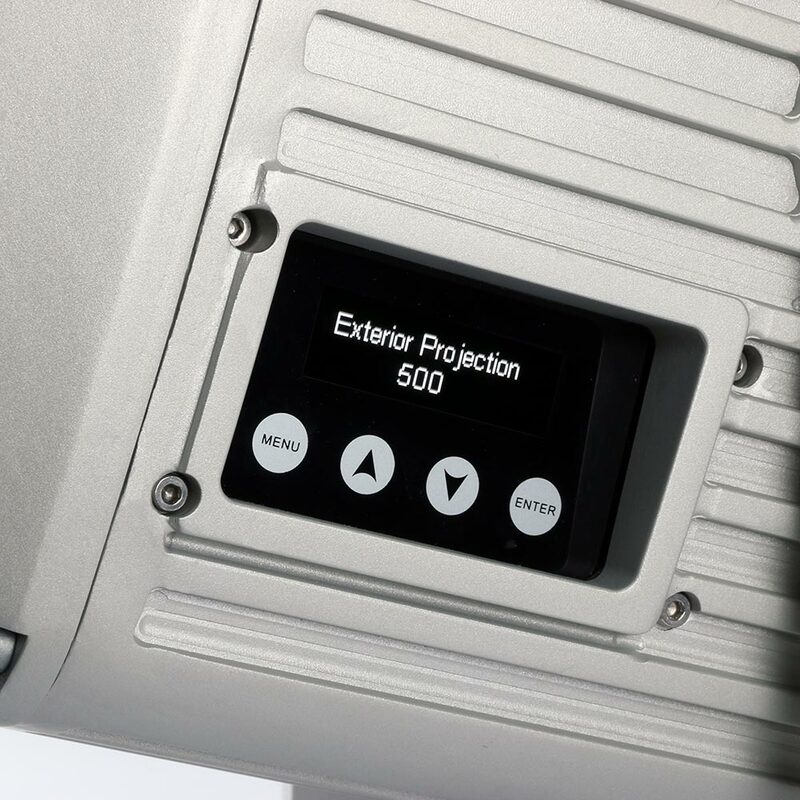 The Exterior™ Projection 500 is a powerful fixture for integrating textures, patterns and graphics in outdoor lighting designs. The fixture can be used for bright and dynamic logo projection as well as precision framing. 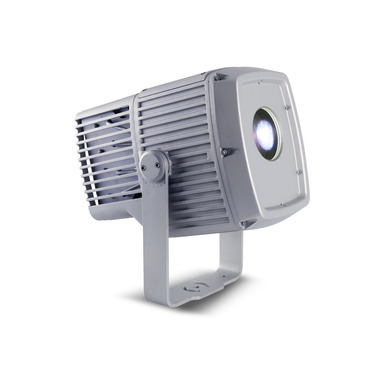 Using advanced LED technology, it offers outstanding energy efficiency, compact size and unlimited creative possibilities. 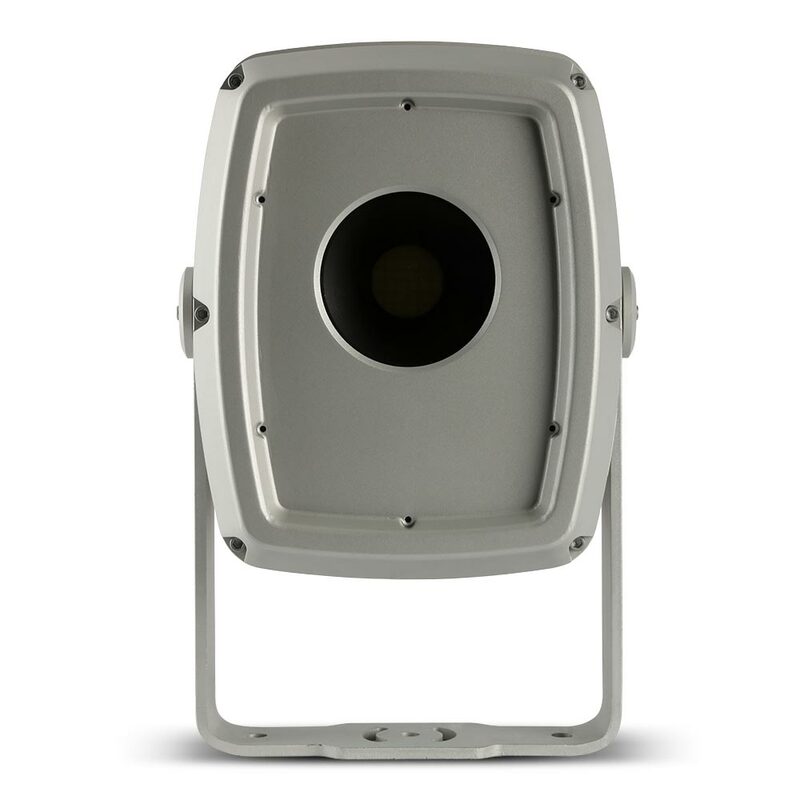 Construction Housing: Cast aluminum Finish: Hard anodized, metallic grey lacquered Front glass: 5 mm (0.2 in.) anti-reflection coated tempered glass Ingress protection: IP66 Impact resistance: IK08 (with control panel display cover plate installed) Corrosion resistance: C5-M (very high corrosivity / marine, ISO 12944) EPA (Effective Projected Area): 0.15 m2 RoHS compliant Gobos Suitable material: Borosilicate glass, coatings heat-resistant to 450°C (842° F) Alternative material: Aluminum 1060, paint on front lens side, 450° C (842° F) Gobo diameter: 30.0 mm +0/-0.3 mm (1.2 in. +0/-0.02 in.) 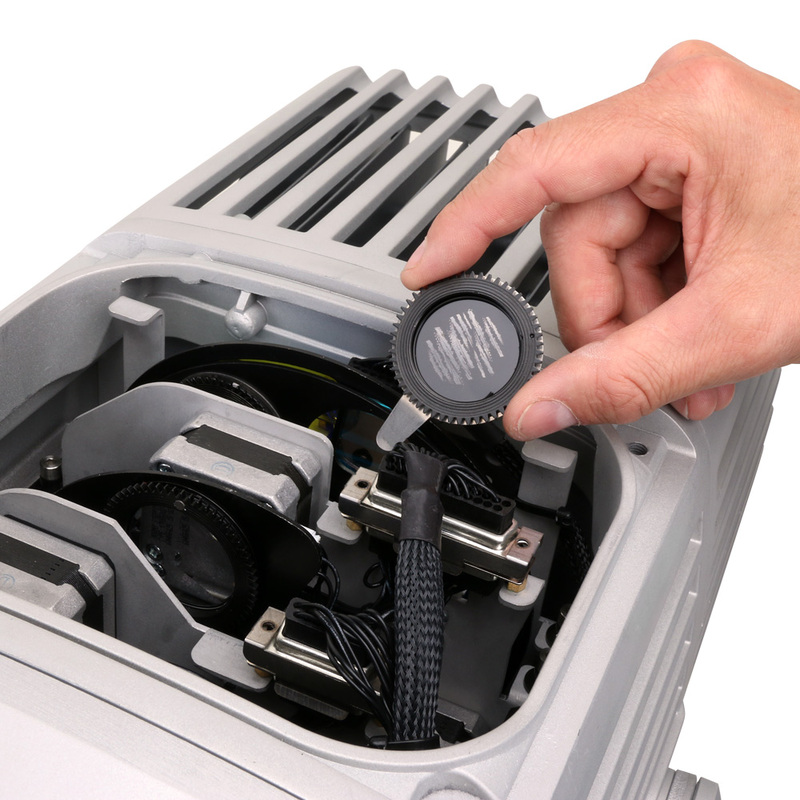 Maximum image diameter: 23 mm (0.91 in.) Glass gobo thickness, minimum: 1.1 mm ±0.1 mm (0.045 ±0.004 in.) Glass gobo thickness, maximum: 3.0 mm ±0.3 mm (0.12in. ± 0.012 in.) Aluminum gobo thickness: 0.5 mm ± 0.02 mm (0.020 in. ± 001 in.) HT paint Installation Mounting: Adjustable yoke Minimum distance to illuminated surfaces: 0.5 m (20 in.) Orientation: Any (sides must be kept vertical) Location: Suitable for wet locations. Do not immerse in water. 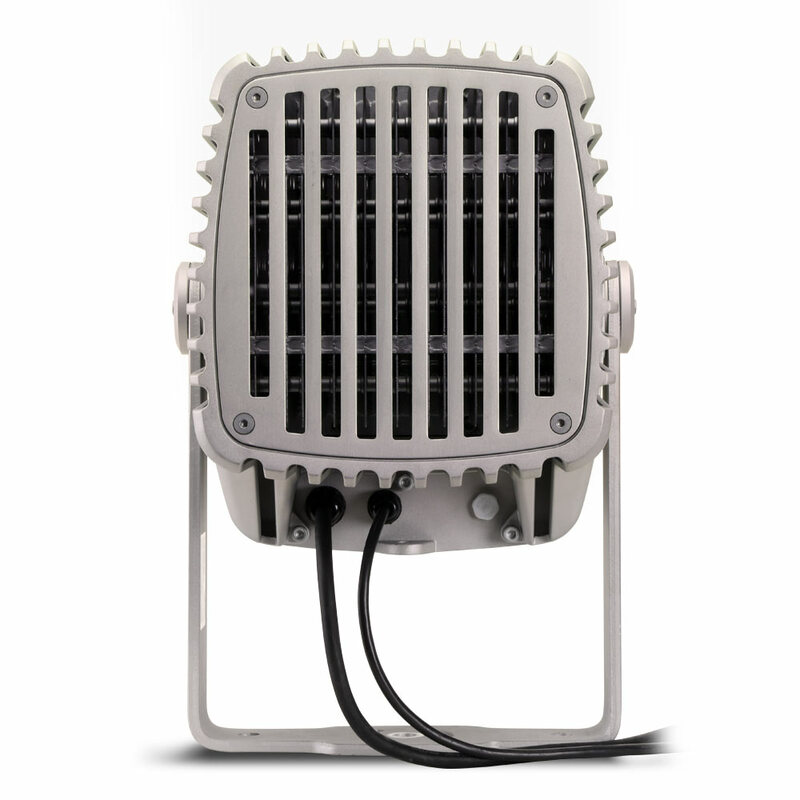 *Above this temperature, the fixture regulates output to protect from overheating.